I read that Dogs can help people to detect Bedbugs in Hotels by smelling them out, I am not going to celebrate this news. As you can see, Bedbugs is low on the list. "I have the Dogs to detect Bedbugs." I already hear too many excuse for these mongrels, I will move out of a hotel because of Dogs or Cats, they are not acceptable in my world. Pet Lovers are akin to Smokers, they believe everyone around them must accept them or something is wrong with them. Dogs and Cats love me, if I even left the door open for a minute, they will move into my room and set up housekeeping, mark their territory and become my best friend whether I like it or not. I do understand that Dogs are needed for security in many countries, however very few owners clean up after the dogs properly and cats for sure are unacceptable in Hotels. "This Dog is going to get some operant conditioning in a minute." For those of you that were business major and avoided Psychology 101, click here to read. We must teach the business majors to talk, I am sure there is some form of operant conditioning that can be utilized. 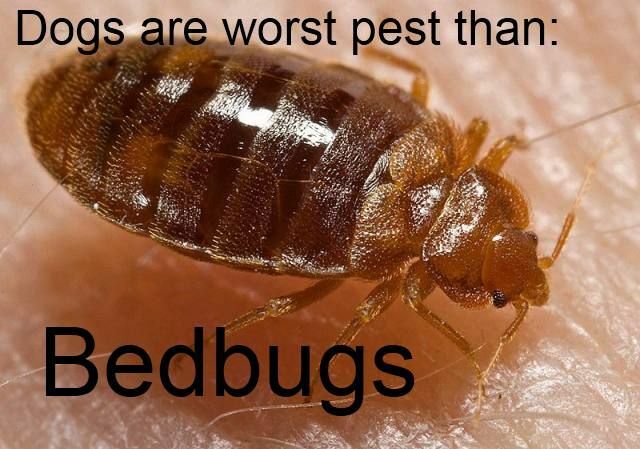 In 12 years of living in Hotels, I have only experienced 2 hotels with Bedbugs. Look under pillows if you are paranoid, you can see them. 1. Move out of Hotel. 2. Wash you clothes in hot water. 3. Dry in sun for about 24-48 hours. Do a review of the Hotel, and tell people.